This was finished today (11/20/2017). I give thanks to the competitive folks in my club (code R5WC4K) who have been keeping me motivated. Wow, that's quite impressive! Did you know any Chinese before you started? I’m a native Cantonese speaker. However, from my conversations with Mandarin speakers, I realize Cantonese is indeed a separate language and not a dialect. A lot of grammar structures do not carry over, and the choice of words for concepts are not always the same. A former Mandarin learner colleague of mine who also spoke Cantonese told me that she had to immerse herself for 6 months to be able to learn the language. I guess that will be my benchmark. Luckily, there are a lot of correspondences much like a Spanish speaker would find in Italian. This is also the case for a lot of other so-called “dialects” of Chinese. I assume written Mandarin is more familiar for you than the spoken version? The written version is not exactly familiar to me as I did not touch simplified Chinese before starting this course. In fact, my knowledge of Cantonese is mostly oral. Listening to a Mandarin speaker, I can pick out a few compound words if the initial and final consonants are similar in all the syllables, but that’s the extent of my abilities. I have trouble with the tones too sometimes. Mandarin tones do not have a one-to-one correspondence with Cantonese tones especially since historical developments have completely randomized tones for certain characters in Mandarin. The initial consonant and finals are pretty predictable going from Cantonese to Mandarin, but the vowels take a bit more guesswork. Knowing Korean also gives me something to mentally cross-reference if I need to decide between two possible sounds computed from Cantonese pronunciation. i think, there is not such thing as written Mandarin, its a spoken "dialect". The writing systems in China are only simplified and traditional. I think he means the written form of the dialect. Standard Mandarin and Cantonese are the only Chinese languages that are completely representable by Chinese characters. The other ones do not have written forms for all words—especially the vernacular ones. As the varieties of Chinese diverged, a situation of diglossia developed, with speakers of mutually unintelligible varieties able to communicate through writing using Classical Chinese. In the early 20th century, Classical Chinese was replaced in this role by written vernacular Chinese, corresponding to the standard spoken language ("Mandarin"). Although most other varieties of Chinese are not written, there are traditions of written Cantonese, written Shanghainese and written Hokkien, among others. I also recall the experience of my college roommate, a native of Hong Kong but who had left early enough he'd had little or no exposure to spoken Mandarin but could nonetheless understand the written form (of course pronouncing it in Cantonese). He had some travails figuring out where to fit into the Mandarin course progression at our university in attempting to learn to speak it. All the dialects can be (mostly) written, in the traditional and simplified writing systems. But wouldn't writing e.g. Wu in simplified characters kind of be like writing English in Cyrillic? Something that could get the point across but that would be odd? Your english is quite good Likenun Congrats! So is yours mate! Congrats! Wow. You might be the first person who has finished the Chinese course for English speakers. Good job !!!! Well done mate! When did you start this Duolingo Chinese Course? I only discovered the course was available 2 days ago, but it looks like it came out over a week ago. I've started from the beginning and got over halfway, just past the 4th checkpoint. Think it's great having this course but the beta thing slows progress as so much is not accepted. It was a month ago before beta. A lot of things needed fixing and that slowed me down a lot. oh, you could do it before beta? I couldn't even see it available. How did you get onto it? Yeah, I can understand it slowing you down, I found the same even with the beta as so many correct translations were not accepted, which was to be expected. That's pretty awesome, congrats dude! How can you possibly remember all of the characters? I was in the beta program and am still stuck on contact. Once you have the mental framework for encoding the characters, it is not too difficult. Chinese characters are decomposable into basic elements. The elements are also sometimes phonetic and/or semantic. The levels displayed in the forum are only based on how many experience points you've earned. It doesn't have anything to do with how many skills (e.g. Greeting 1, Numbers, Name) you've completed. The highest level for all languages is 25. Depending on how many skills the different courses contain, it's possible to do all the skills (on the web or iOS; looks like it's more complicated on Android) and finish with a minimum level from 8 to 13. I did each lesson once on Android. Of course, I did not get the full 15 points every time since there were so many ways to get the answers wrong. In the end, I ended up at level 12. I think most people will hit 12 if they did each lesson once on Android. Hands up who else has completed the Chinese-from-English Tree? Did you go from placement or from the start? ps I think there must be quite a number getting there as I've noticed a lot with a reasonable ranking already, as well as quite a bit of feedback on lessons right up to the halfway point I'm at. Can't look ahead as those lessons aren't unlocked for me yet. I am only about 20 of the 88 lessons in. I spend lots of time reviewing and using other resources online to really understand what I have studied already. but wow, level 16 already? I've completed the tree and only level 11. I guess you get lots of points reviewing? I review lessons every day until I know all the characters and sentences off by heart. Also, I'll go through the sentence discussion and read the problems and questions people post. I'll answer the questions I know and then use the interest and friends to help try and answer the ones I don't know; if I am not comfortable answering, I will at least try to learn and figure out the question for myself as much as I can. I have completed the chi->eng and the eng->chi trees. Neither tree is completely golden yet - maybe in about a week they will be. I started from the beginning and kept going. A long, long time ago I took Chinese courses and loved them. 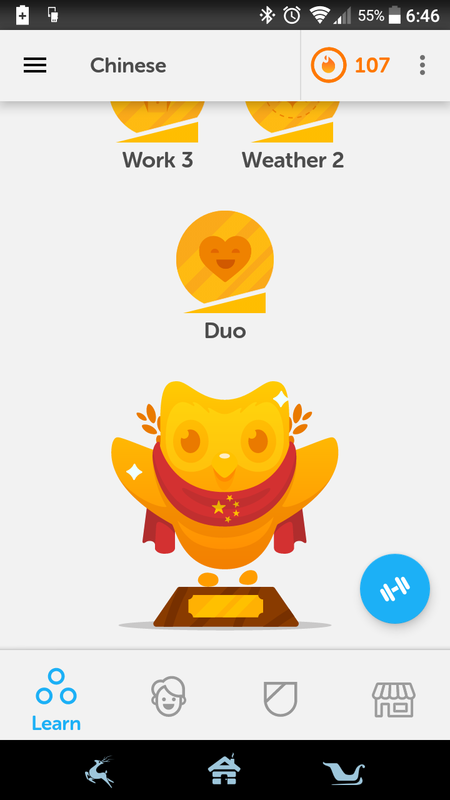 Thanks Duolingo for the Chinese course! What is your club code? How many Chinese words does Duo say you’ve learned?